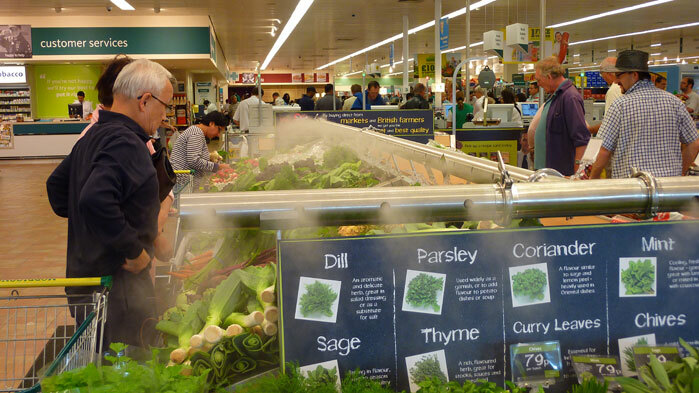 The relative humidity (RH) in a supermarket or large retail environment is often very low, both in the winter when heated and in the summer when air conditioned. This can be overcome by installing a Tru-fog system, which will boost relative humidity around the product, maintain the natural moisture level within and even re-hydrate some produce. Super pure, filtered water is nebulised using high frequency, ultrasonic waves. This creates a dry fog of tiny water droplets, each less than 5 microns in size. Traditional misting systems have droplets of 15-20 microns. The ‘almost lighter than air’ fog spreads over the produce like a blanket, forming a cool, moist layer above and around the product without wetting. The relative humidity around the display is raised to around 95% and as the water droplets quickly evaporate, the ambient temperature of the air will be reduced. This adiabatic effect is often called ‘evaporative cooling’. The fresh produce will no longer loose its own moisture into the ambient air and is additionally cooled, without getting wet. Reverse Osmosis Filtration – to remove bacteria, viruses, calcium and other scaling minerals which are often present in city water. Ozone Generation – to destroy bacteria that may have entered the system through the air. Ozone is a very strong oxidizer which converts back to normal oxygen in a short time, without leaving a residue. Ultra Violet Light Treatment – to destroy microorganisms and pathogens in the water. UV sterilisation leaves no residual chemical or radiation in the water. Automatic Self Cleaning – The system is flushed and self cleaned with super pure water every 60 minutes. Specialist Maintenance – Our regular service and maintenance programme will guarantee a problem free and hygienic operation. What are the benefits of ultrasonic humidification for you?